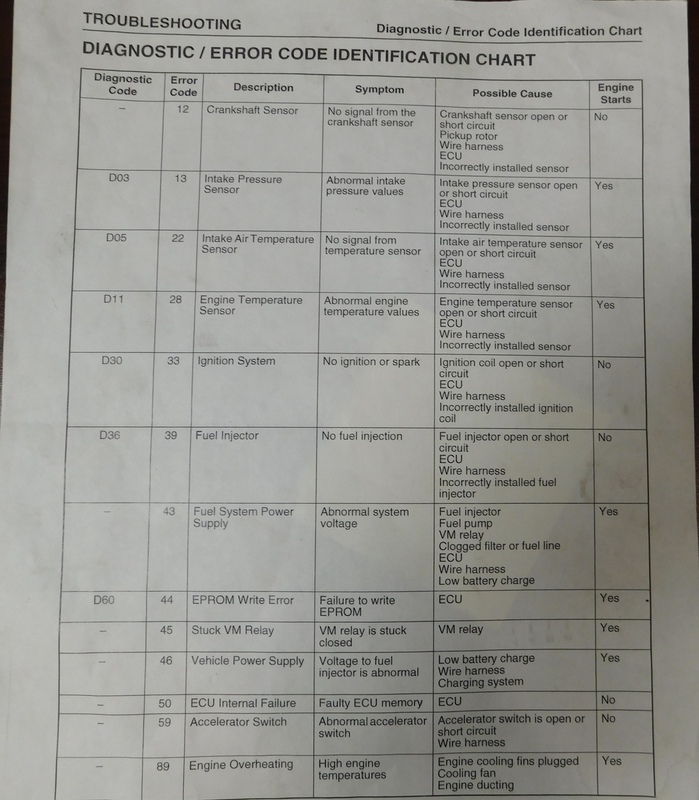 Does anyone have a list of the efi fault codes? Error codes are 2 digits. So, 1 flash then out then 2 flashes would be code#12. Error code #12 is "crank sensor", but the car would not run if it or the wire harness were damaged. Try to check the error code again and get back with what you find. I pulled the sensor out and checked the connections.. everything seemed good to me. Is there a list of the fault codes? I tried to post it, but for some reason, the image would not post Still think it is one of the 2 wires is a bad connection in the plug. Good luck. I did not know there were flash codes for the EFI module. Where is this code flashed physically on the cart? The reason I ask is I have to look at our cart today for intermittent fuel smell and I seem to be burning more fuel than usual but can't find a physical leak. I suspect the EFI may be to blame. Thanks.